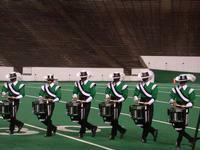 The Cavaliers Drum and Bugle Corps (widely known as "The Green Machine") is a World Class competitive junior drum and bugle corps.based in Rosemont, Illinois. In 1948, scoutmaster Don Warren of Boy Scout Troop 111 in Chicago's Logan Square neighborhood saw a performance by the Racine Scouts Drum and Bugle Corps. Soon thereafter, he led the formation of Troop 111's own corps. Dressed in traditional Boy Scout uniforms decorated with shoulder braids and white gloves, the corps spent its formative years as a parade corps, while Warren and the other staff were concerned with sponsorships, finances, and other related circumstances. In 1949, American Legion Post 712 in the Little Warsaw section of Chicago became the corps' first sponsor. Post 712 was named in honor of the Polish-American Revolutionary War hero Thaddeus Kosciuszko. Mispronounced more often than not, corps members shortened the post name to Koz-712. Sponsorship by Koz Post 712 freed up a little money for new uniforms. The corps put together a low-budget uniform with 100%-wool Army surplus dress pants and shirts and had them dyed a dark blue, but buttoned shirt cuffs and puttees had the disadvantage of sealing the summer heat in. The next set of uniforms were hand-me-downs from the drum corps at the American Legion's General George Bell Jr. Post 176. Although Don Warren had initially enlisted instructors from the Quinlan & Fabish Music Co., he realized after seeing the Bell Corps up close, that instruction more directly relevant to drum corps might be better. Johnny Line and Art Gariekes began to teach Kaz-712 drill and competition; it had been a parade corps until 1950. Shows were 15 minutes long in those days and the tunes were comparatively short, so it took a lot of quickie numbers to fill up a show. Corps members in the early 1950s formed a close-knit group, having grown up with each other. They wanted to perpetuate this fraternal feeling, so they created initiation rites for new members. In terms of pride and character, they tended to pattern themselves after another corps, the U.S. Marine Corps. Marines still have initiations too, called boot camp, instilling pride, character, and a spirit of belonging. The Cavaliers continued their initiation rites for nearly their entire history. After a summer full of parades, contests, and other appearances in 1950, it was time to select new uniforms for 1951. Following the Bell Corps‘ example, comfortable open necks and loose trousers in a swashbuckling Cavalier style were selected. (The members' initial vote was for chartreuse as the dominant color. 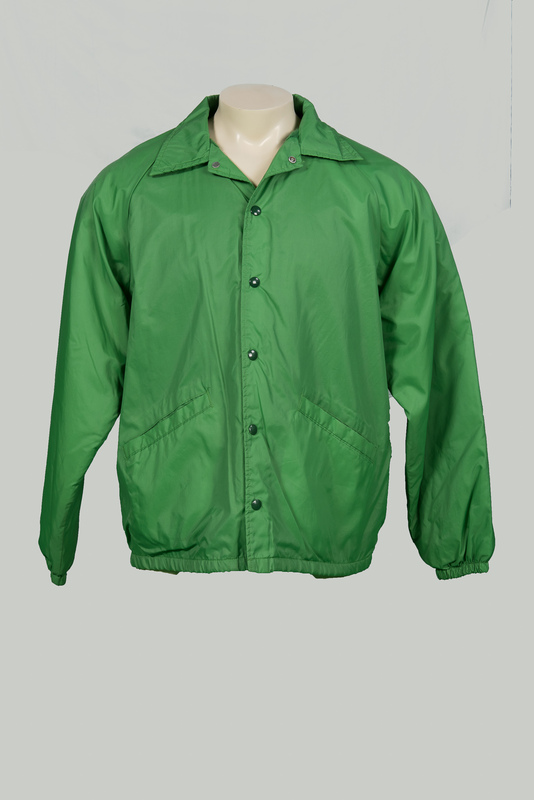 When the uniform maker explained the fading effect of the summer sun, the second choice quickly became Kelly green.) 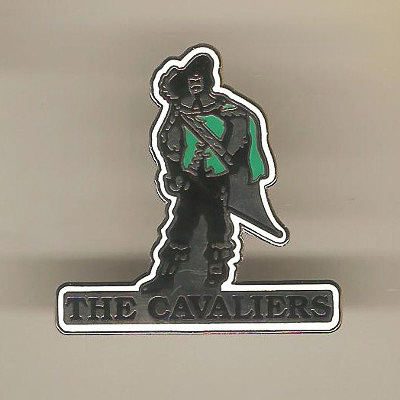 With mostly minor annual changes, the musketeer-swashbuckler look has now been the Cavaliers’ style for close to seventy years. A turning point for the young corps came in 1952. After more than two seasons of being an also-ran, the Chicago Cavaliers won the Iowa State Fair contest--- the corps' very first win..The corps traveled to New York City for the American Legion Nationals. Their seventh place finish was highest among Midwest junior corps, and the Cavaliers won the high Gemeral Effect caption. The experience solidified “Somewhere Over the Rainbow,” not only as the corps' theme song but also as a corps philosophy. In 1953, the Cavaliers won the corps' first Illinois State American Legion title and placed eighth at American Legion Nationals in St. Louis. In 1954 the corps gained momentum as a Midwest powerhouse by winning a second consecutive Legion Illinois State title. 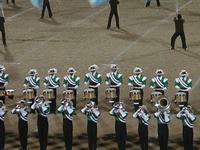 Many predicted the Cavaliers could take a national title if they could get their drum scores up to East Coast levels. 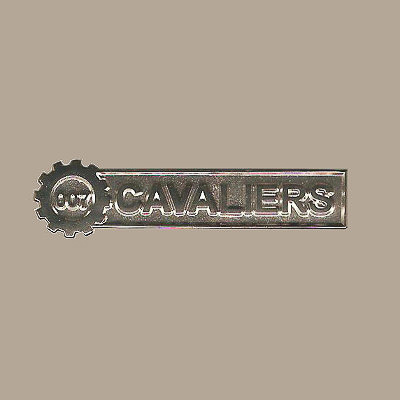 With percussion being the proverbial Achilles heel, the Cavies placed a disappointing tenth at Legion Nationals in Washington, D.C.
Little did anyone suspect, but that tenth place finish placement would be the corps’ lowest in a national competition for the next 19 years. 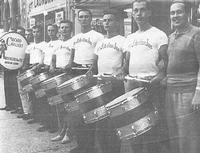 In 1955 the management brought in the legendary rudimental drummer Frank Arsenault to work with the percussion. His work conferred instant credibility. The corps won its first VFW State title and finished a strong fifth at American Legion Nationals in Miami. The Chicago Cavaliers were on the move. 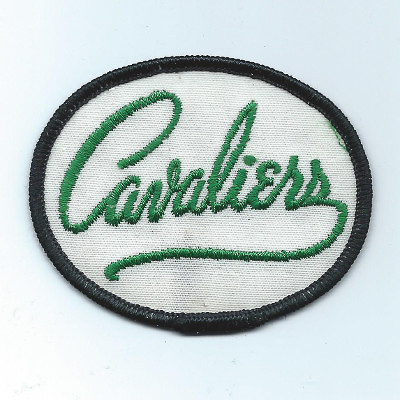 1956 brought another VFW State title and a number one ranking in the Midwest, but even after a season of 16 wins out of 20 contests, the Cavies returned home with only a third place finish at VFW Nationals. The corps traded victories with both the Madison Scouts and the Belleville Black Knights throughout the 1957 season, though they managed to win both Legion and VFW State titles for the first time. The highly competitive summer seems to have been the preparation the corps needed to win their first VFW Nationals in Miami, the first time that a Midwest corps had broken the stranglehold of the East. Many nearsighted East Coast drum corps people passed the victory off as a fluke. 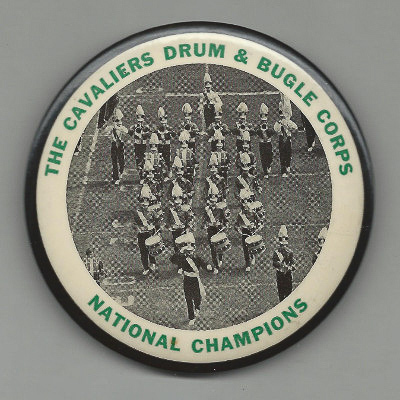 Despite repeating as national champions in 1959, daunting challenges faced Don Warren, corps treasurer Martin McDonald, and the Cavaliers organization. 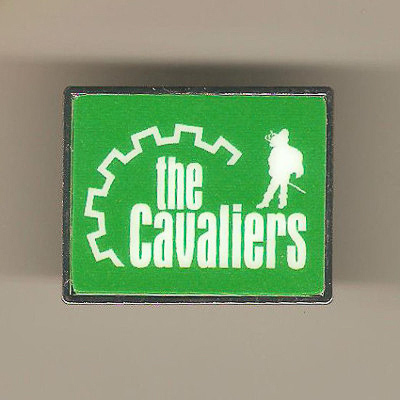 Show titles held for years by the Cavies were slipping away, American Legion and VFW sponsors were struggling to sustain the corps financially, and the turnover after 1959 was 30 percent, including long-time corps leaders who aged out. 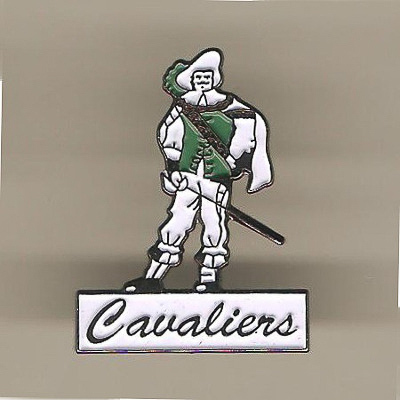 The 1960 season signaled the end of the "neighborhood corps" era of the Cavaliers and began the era of the "suburban corps" phenomenon. This was the first in a series of profound changes in drum corps. The Cavaliers would be one of only a handful of drum corps that would survive and thrive in a new era. Times being tough, the Cavalier members themselves took fund-raising into their own hands with a Family Fun Night in 1960. Clowns, games and a sumptuous repast at "The Cavalier Cafe" netted $1,000 on a $39 investment. The big moneymaking activity of the night was the chance to hit Don Warren in the face with a whipped-cream pie for a dollar, and there was a long line. Efforts to recruit experienced corps members were arduous, particularly in light of the corps’ national championship-level commitments. The 1960 season with all its ordeals developed into a successful one, with the corps earning a 17-4 record and recapturing most of the show titles lost in 1959. While not winning a Nationals title in 1960, the corps had maintained its championship standing. Cavalier Hall, the first such facility in drum corps, received a major facelift in 1960 with new soundproofed practice rooms, new windows, and lighting. 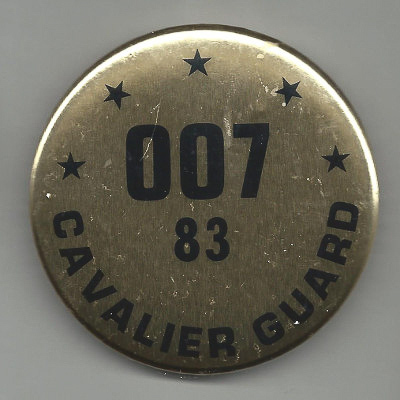 1960 also solidified a special bond between the Cavies and the Garfield Cadets, as Cadet corpsmen housed with Cavalier families during their Midwest tour. The 1961 corps was staffed by a large group of men with a wealth of championship experience. Rick “Monk” Wawrzniak joined John Cabanski as assistant quartermaster under corps Vice President Jim Jones; Monk would serve the corps for almost 20 years. The Park Ridge VFW Post 3579 became a new sponsor, taking over from Chicago's Own Post. After a scary win by only 0.025 at State Fair, the corps went into 1961 VFW Nationals in Miami undefeated for the inevitable confrontation with Blessed Sacrament, St. Kevin’s, and the Garfield Cadets. There the Cavaliers dispelled any suspicion that they were a mere flash in the pan by sweeping all competitors by a wide margin. 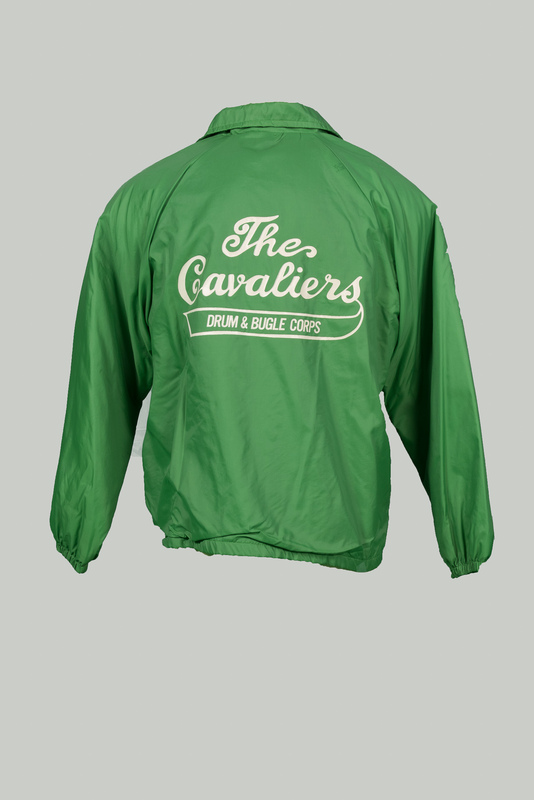 The Cavies finished 1961 with a national championship and a 25-in-a-row win streak carrying over from the 1960 season. The corps had earned the reputation of being "The Green Machine." Major program changes and a large turnover of experienced personnel in 1962 foreshadowed a strenuous effort by the corps to sustain its championship position. 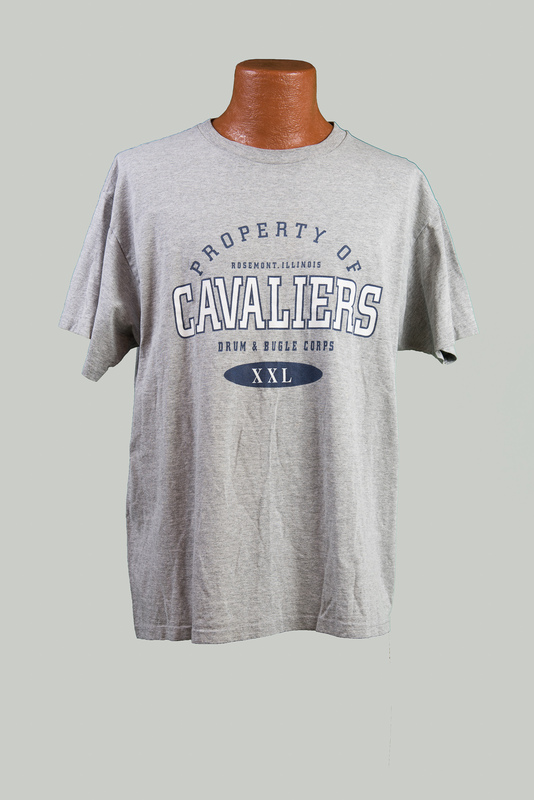 For 1962, only 15 members remained from the 1959 Cavaliers roster. In 1962 Larry McCormick joined the corps as drum instructor, with his tutelage ensuring a championship drum line throughout the decade and beyond. By June 1962, the Cavaliers had not lost a contest in 23 months. Another undefeated season was not to be, however, and the win streak was broken in Spring Valley, Illinois, at 29. Legend tells that the defeat came with the help of “an accordion instructor masquerading as a bugle judge.” The season was a smashing success, however, and the corps finished with a 22-4 record and the corps' fourth national title at the Minneapolis VFW show. The corps in 1962 gained a new sponsor, the First National Bank of Chicago American Legion. 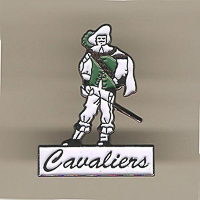 The sixties' Cavaliers had energized local competition by the Cavies consistent dominance. Other local corps had to stay in top form for any hope of being competitive. This translated into an increasingly competitive environment that catapulted the Midwest to the top of the drum corps world. 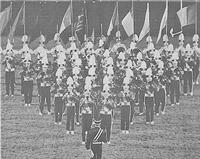 During the sixties, it became usual for at least half of the top ten corps at Nationals to come out of the Midwest. This also meant that the Cavaliers could not ease up without being buried by the constantly improving local corps. 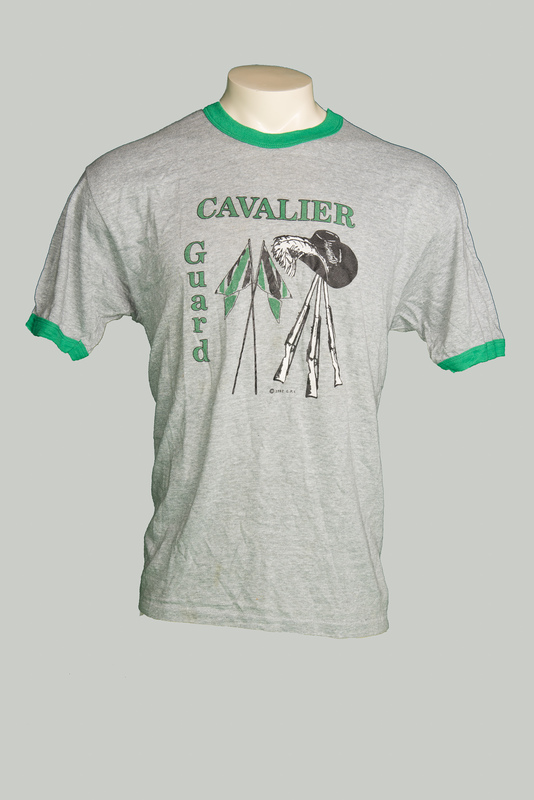 1963 proved to be another outstanding year for the Cavaliers as they won 19 of 24 shows and another national title, the fifth in seven years. 1963 also witnessed the completion of the transition from a neighborhood corps to the modern corps with an ever-widening outreach for personnel, welcoming out-of-towners from as far away as Rockford and Milwaukee. The 1963 season took the corps to distant parts. It began with an offering of international good will at the Optimists show in Toronto (they promoted their show by proclaiming, "The Cavaliers are Coming!!"). Through the hard work of staff and boosters, the 1963 Cavies were treated to a 6000-mile train trip to the VFW Nationals in Seattle. VFW officials greeted the corps like dignitaries there, including providing folding chairs to rest on as the corps awaited their Finals performance. The 1964 corps was the vehicle for another new innovative program, featuring newly acquired mellophones and contrabasses. The Cavies introduced the concept of turning bass drums sideways and tuning them to the corps' pitch for enhanced musicality. With a record of 22-6 the corps was at the top for most of the season, winning both American Legion and VFW Illinois stste championships, and hanging on during the wild scoring ride that led to a third place finish at VFW Nationals in Cleveland behind the Racine Kilties and the Chicago Royal Airs..
1965 was a good year, but it was the year that the Cicago Royal Airs became the only corps, ever, to win the CYO, VFW, and American Legion National titles in the same season. 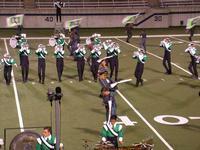 The Cavies were second behind the Royal Airs at the Illinois Legion and VFW National contests. After adding tuned bass drums the previous year, 1965 was probably the year that the bass drum line developed the legendary street beat, "Iowa." To the present day, the cadence is played by The Cavalier bass drum line as the corps marches off the field after every performance. The 1966 program featured the outstanding drum line of that period. The corps come within 0.8 of winning both Legion and VFW titles, but ultimately came away with only the American Legion title, as the Troopers wase also a dominating corps that year. A change in 1966 was the field show not featuring “Over the Rainbow” after only 18 consecutive seasons dating from the corps' beginnings. Cavalier Hall departed in 1967. On a warm July evening, the first drum corps hall ever, at 2507 North Kedzie, passed into history in a "Viking funeral." The hall burned to the ground with all its trophies, its uniforms, its memories, all but its traditions and competitive spirit. Only the Cavaliers lived on. 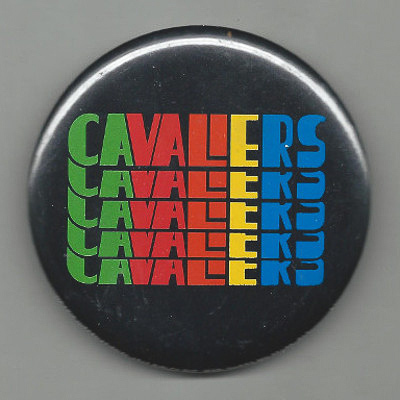 Even without the hall, 1967 marked a return to the pinnacle for the Cavaliers. Making up for 1966, the corps won both VFW and American Legion National titles and finished with a record of 24-2. For the third year in a row the drum line won its caption at Nationals. Later, renowned drum instructor and respected judge Bob Curry called the 1965-67 drum line one of the best drum lines ever. Despite the championship drum line, the 1968 season was one of frustration and a constant grinding struggle to stay on top. The VFW Nationals show will be remembered as one of the closest ever, with less than two points separating the first five corps. Only Troopers were from outside the Midwest, and two others were Chicagoland neighbors of the runnerup Cavaliers. If 1968 was a valley, then 1969 was truly a return to the summit. An 18-7 record and another American Legion National title put the Cavaliers back on top. In 1968 Paul Litteau had joined Lenny Piekarski's M&M team as an assistant after a successful run as color guard instructor. This move continued a tradition of alumni Cavaliers returning to support the corps with their volunteer efforts, a practice including such men as Warren Alm, Don Heitzman, Dan Horst, Adolph De Grauwe, Jim Zientara, Lou Miller, Jim Kropid, Art Mix, Larry McCormick, Bob Hoehn, Bill Dragland, Bill "Doc" Glass, and many others. It is through this process that not only the Cavaliers corps but also the Cavalier traditions are passed on to later generations. In the tumultuous seventies, it would be these alumni joined by "the miracle worker" alumnus Frank Speciale who would play key roles in sustaining the Cavaliers both financially and competitively. The seventies were a time of change and upheaval for the world, the country, and drum corps. The Cavaliers were not exempt. The corps learned that they were not guaranteed top three, old formulas were no longer good enough, and new players and new organizations were coming to power. They learned how to fight back, rebuild and fight back again. But they never learned how to lose. The Cavaliers started the decade as a contender for championships and ended it knocking on the door again. In between, some real adventures tested whether the corps would even survive. The decade began with a miraculous finish, when the corps moved from 11th in Prelims to third in Finals of the VFW Nationals in Miami. 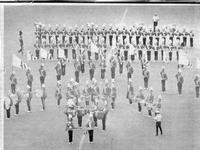 In 1971, Don Warren and Troopers founder Jim Jones, pulled together the Blue Stars, Cavaliers, Madison Scouts, Santa Clara Vanguard, and the Troopers to form the Midwest Combine. This was a reaction to the rigid, inflexible rules of the American Legion and VFW (the primary rule makers and sponsors of both corps and shows) and the low or nonexistent performance fees paid for appearing in the various competitions. A similar group of Eastern corps, the United Organization of Junior Corps (also known as the "Alliance"), was formed by the 27th Lancers, Garfield Cadets, Boston Crusaders, Blessed Sacrament Golden Knights, and Blue Rock. These corps stated that not only were they having their creative potential as artistic performing groups stifled, but they were being financially starved. The Combine and Alliance members further declared that the corps should be making their own rules, operating their own competitions and championships, and keeping the bulk of the monies those shows earned. For the 1971 season, the Combine corps stuck together, offering show promoters the five corps as a package. Despite pressure on show sponsors, judges, and other drum corps, the Combine corps were not only booked into a number of shows together, but they found a host for a show of their own, which was a spectacular success despite fears of failure. But 1971 was not as much of a success for the Cavaliers. Their ill-conceived progrm with the guard doing an Irish jig and a circus section was not well-received, and the corps fell to eighth at CYO Nationals and, with most of the top corps opting for VFW Nationals, they finished in second behind the Argonne Rebels at the Legion Nationals in the Houston Astrodome. Deciding that the 1971 themed show concept was a mistake, the corps went back five years in show design, but the results were even worse, as the Eastern corps began to wreak revenge for years of defeats.. They survived on solid execution until the first DCI Nationals in Whitewater where they finished ninth. Of the DCI charter members, only the Cavaliers and Argonne Rebels went to the 1972 American Legion and VFW Nationals, with Argonne winning the American Legion title and the Cavaliers taking its seventh VFW crown. The corps was seriously troubled by 1973. Recruitment waned, as seemingly no one wanted to join the "boring old Cavaliers." The staff seemed to have run out of good ideas and couldn't keep up with a rapidly changing activity, and members admitted to having difficulties in executing the programs. There was financial trouble, too. Only later did it become known that Don Warren was so concerned about all of the varied issues that he seriously considered shutting down the corps in 1973. However, the unity and determination of the members themselves helped sustain management through the tough times. The corps finished the season 15th at DCI. The corps in those years was riven by several factions, generating conflicts that were damaging to the organizations' ability to operate cooperatively or effectively. There were the "Old Cavaliers" who clung to the past glories, the "Wild Bunch" who felt anything was okay as long as they made it onto the field, and a new species, the "Corpies" ---the guys who began jumping from corps to corps in search of a DCI Champion's ring. Then came the incident in which a few corps members nearly died from drugs on a corps bus. 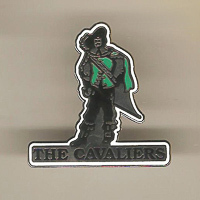 This forced management to face the drug problem among some members of the Cavaliers. The incident polarized the corps family, heightening tensions between the several factions. Management encouraged members, parents, and boosters to contribute their feelings and opinions before settling the painful issue. Seven corps members were suspended for the remainder of the season; only two eventually rejoined the corps. 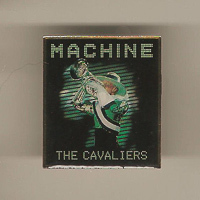 Competitively, the Cavaliers remained in DCI’s second six from 1972 through the mid eighties, even missing finals in 1973 and 1978. They did, however, win the VFW Championships in 1972, '74, '76, and 1980, but VFW and American Legion Nationals became less and less important as DCI grew in stature. Shows during this period featured show tunes and light opera, with some pop music. The long-time theme song “Somewhere Over the Rainbow” was retired as a show piece in 1980, remaining in the corps' repertoire for special occassions and as an encore feature. A classical trend was creeping into the corps’ repertoire through the seventies, a wave that solidified into full-blown contemporary classical shows by the mid eighties. Along about this time, the Village of Rosemont and the Cavaliers had their first point of cooperation. Alumnus Frank Speciale workied as a public safety officer (combination police officer, firefighter & EMT) in the village located right next door to O’Hare Airport. One day, Rosemont mayor Donald E. Stephens asked him how things were going with the drum corps. When Frank told him that their buses had recently been vandalized in their Chicago parking location, Stephens offered, "Why don't you park them in the Village lot; we have plenty of room." Thus did the camel's nose slip into the tent. 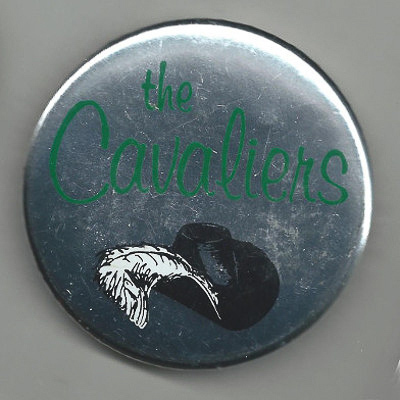 In the early 1980s, judges seemed to be looking for more cutting edge performances than the Cavaliers were providing, but those performances began to appear with the rise of the Cavalier winter guard. 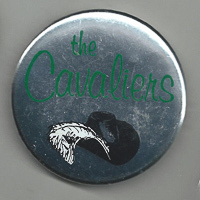 Under the creative guidance of Steve Brubaker, the Cavaliers would win the Winter Guard International Championship in 1981, 1982, and 1983. Steve became the Cavaliers' head drill writer in 1982 and ultimately established himself, along with George Zingali, as one of the great visual designers of the decade. 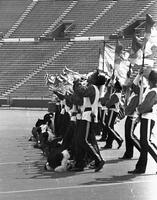 The success of the Cavalier winter guards motivated a change in attitude in the early 1980s. The Cavies asked themselves, "If we can win WGI titles every April, why can’t we win bigger titles in August?" 1983 saw an exploration of jazz, led off by alumnus Michael Boo's composition "Jade." However, the "Pines of Rome" closer seemed better suited to the corps. The 1984 program was an evolutionary step in the right direction. With “Don Juan” as an opener and a return of “Pines of Rome” as the closer, the show offered a vast improvement over previous program designs. Although the guard was strong and the corps was marching decently, however, the horns and drums were still not playing well enough to compete with the big boys. 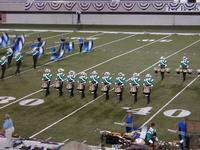 The Cavies' 8th place finish at DCI was its highest in half a dozen years. In early 1982, Mayor Stephens again asked Frank Speciale how things were going with the Cavaliers. Frank explained that the City of Chicago, in return for its $1000 annual sponsorship stipend, had just submitted a schedule for the corps to appear at so many community events that there would be no time left to enter competitions. The city was reluctant to either reduce the number of appearances or to increase the sponsorship amount. The corps could not see a way to fulfil the schedule and also be a competition corps, but it really needed the sponsorship check. The mayor asked if the corps would be willing to be sponsored by the Village of Rosemont. The corps would only be required to play at the community Fourth of July celebration, and it would receive a much larger stipend than Chicago was paying. Several buses, a few trucks, many uniforms, and many staff paychecks later, the generosity of Rosemont to their official "Marching Ambassadors" is obvious, appreciated, and cannot be overestimated. Around this time, the Cavaliers revamped their initiations process, becoming a "kinder, gentler" drum corps to new members. 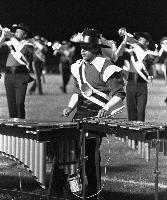 The pivotal year of the decade for the Rosemont Cavaliers, and perhaps the most important year of the DCI era, was 1985. This was the year that the Cavaliers put together a staff who developed a show design built around Holst's “The Planets” that vaulted the Cavies to the top half of DCI's Finals for the first time, with a fifth place finish. 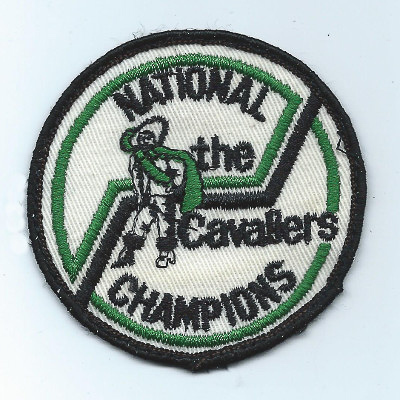 Although the Cavaliers won no national championships in the 1980s, they spent six years in a row in the upper half of the Top 12 and left the decade much stronger than they began it. The 1990s brought three-valve bugles, which turned out to be strange and troublesome to some performers. In 1991 Adolph De Grauwe passed the torch of corps directorship to Jeff Fiedler who led the corps until 2008; De Grauwe returned as director in Fall 2009. The pit had a great year in 1991. Before every run-through they would pound through their ensemble piece, written by Dave Samuels, so often that the horn players could whistle it. Practice in this case did make perfect, as the pit received a perfect 100 in CDI's Solo and Ensemble competition. They were also featured in a percussion magazine that year. 1992 started off with a fire on the equipment truck. Perhaps all years should begin so disastrously--- if they can end so triumphantly. With a program entitled “Revolution and Triumph,” 20 years into the DCI era, the Cavaliers won their first World Championships, beating their two closest competitors by less than one point. The Green Machine had finally reached the summit, an achievement, one corps member said, that would not have been possible without the groundwork laid by hardworking corps members over the previous years. 1993 was a difficult year for several reasons. 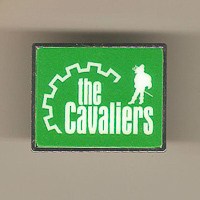 After the 1992 season ended, the corps lost Steve Brubaker, a pioneering drill writer and one of the prime movers in leading the Cavaliers back to the top. Then too, everything done that summer was overshadowed by the previous year’s championship. 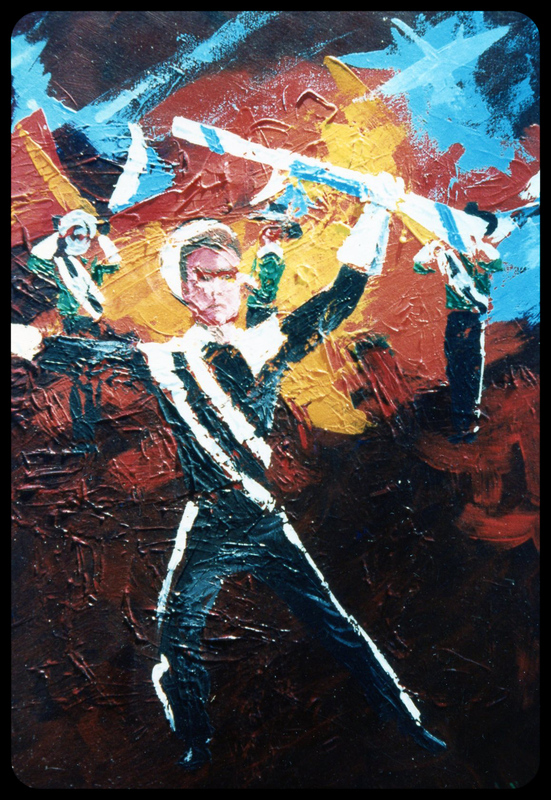 The show was 'Heroes: A Symphonic Trilogy,' and before the show, drum major Dan Hough announced that the program was dedicated to the members' own Cavalier hero. The corps had its greatest success in California this year, winning all the shows and leaving the state undefeated. DCI Finals were in hot and soggily humid Jackson, Mississippi. Finals night was wet--- on slippery grass the show was not nearly as successful as it had been through the season, and some Cavies ended the season after landing on their butts. The corps ended up in fifth place. 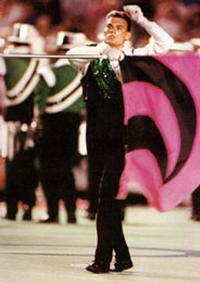 In 1994 the show was different, but the Cavaliers had been back on the cutting edge of the activity for a decade. There were more props and equipment than ever before. Although all corps members had a lot more movement to perform than just straight marching, the color guard was the focus of this show. In controversial uniforms that showed their bare chests, the guard manipulated large pieces of lumber. Warren Rickert climbed to the top of the longest pole and stretched his right arm high, reaching toward heaven as the corps reached the climactic moment of "Ivan the Terrible.” The innovative design was not enough to catch Blue Devils, the Cadets (then) of Bergen County, and Phantom Regiment, and the Cavies had to settle for a fourth place finish at DCI Finals. The Cavaliers won their second world championship in three years in 1995, with another powerful program of Holst’s “The Planets.“ The stars were not entirely in alignment, however; when the field lights went out as the corps came out for a victory performance, they did a standstill in the dark. When the lights came back on, they did their whole victory performance all over again. Before the summer of 1996 the corps had the opportunity to travel to Japan, a trip sponsored by His Ten Boost theme park in Nagasaki. Back in the States, the Cavaliers finished fourth at DCI. The Cavies slipped to seventh place in 1997 with a program of Stravinsky’s “The Firebird.” Then, the Cavaliers rounded out the 20th Century in triumph, with the "Niagara Falls" show tying the Cadets (still) of Bergen County in 2000 for the DCI World Championship, the corps' third crown and the Cadets' ninth.. 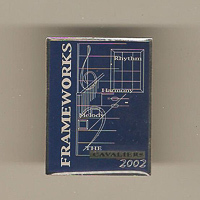 The 21st Century started spectacularly, when the Cavaliers followed the tie with the starkly angular show entitled "Four Corners" and took the title outright in 2001. 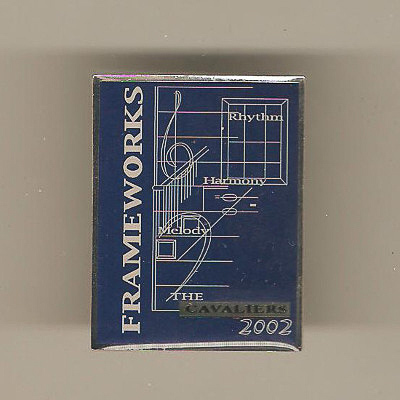 Then in 2002, the corps used the similarly designed "Frameworks" to pull off only the second DCI Championship "three-peat." Three-in-a-row, five DCI crowns, and counting. 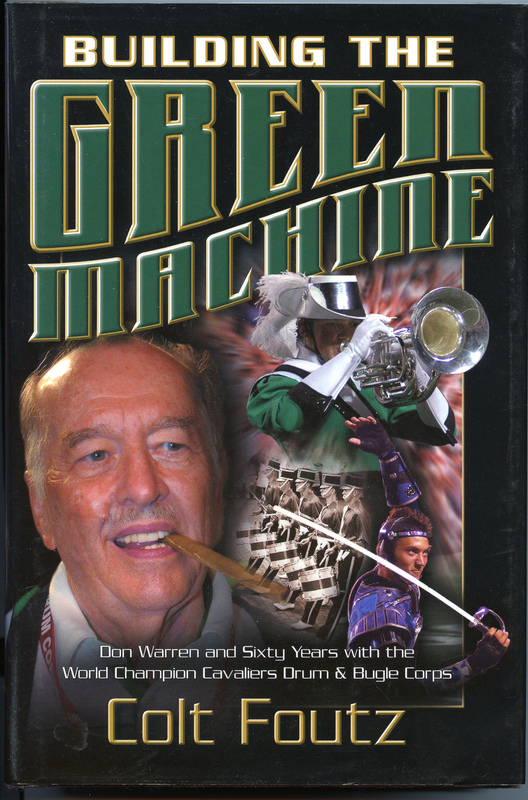 Meanwhile, over the 2002 and '03 seasons, The Green Machine strung together a DCI record of 64 straight contest wins before being edged by the Blue Devils on July 26, 2003. With "Spin Cycle"' the stunning 2003 offering designed by Michael Gaines with original music by Richard Saucedo, Bret Kuhn, and Erik Johnson, the Cavies had bested the Blue Devils three times before having the win streak broken, but once past, BD kept widening the gap. A 97.25 score in Finals was only good enough to earn The Cavaliers a second-place finish. The Cavaliers boast several drum corps firsts in their history: the first corps hall, first large equipment truck, and the first corps camp, all now standard in the activity. Other design and musical “firsts,” innovations adopted by the activity as a whole, are more difficult to quantify but exist nonetheless. For 15 years the corps never placed lower than third in any competition, and in 2004 they had won six national championships in 13 years, a distinction exceeded in DCI history only by the Blue Devils. The 2002 championship score of 99.15 was the highest winning score in DCI's 30-year history. According to then-director Jeff Fiedler, "Status quo is moving backward." 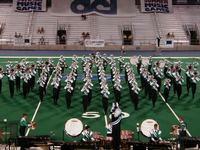 At 2004 DCI Finals, the men from Rosemont presented a cool, stylish show based on music from James Bond films. The Cavies took full advantage of the prop potential of their hats, razor sharp brass blows, and even unison whistling to sell 007. Very popular with the crowd, the program captured high GE on Finals night, and the Cavies edged the Blue Devils by 0.075 point to take their fourth championship in five years, and sixth overall. 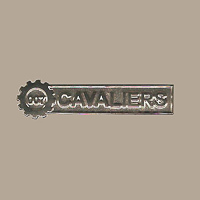 The Cavaliers' 2006 show "Machine" secured the corps' seventh DCI crown and capped a seven year run of five titles and two runnerup places. Since winning their seventh DCI title, The Cavaliers have remained a Top 12 corps, scoring as high as second in 2010 and as low ninth in 2015 in pursuit of the elusive eighth title. 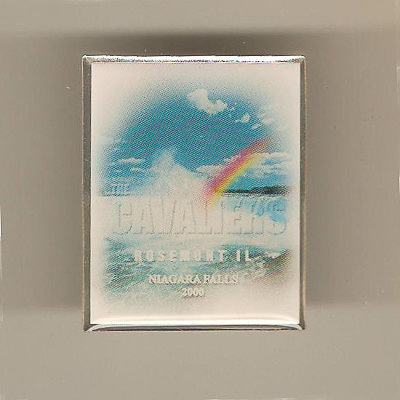 One of only two remaining all-male corps, they are The Cavaliers of Rosemont, Illinois.